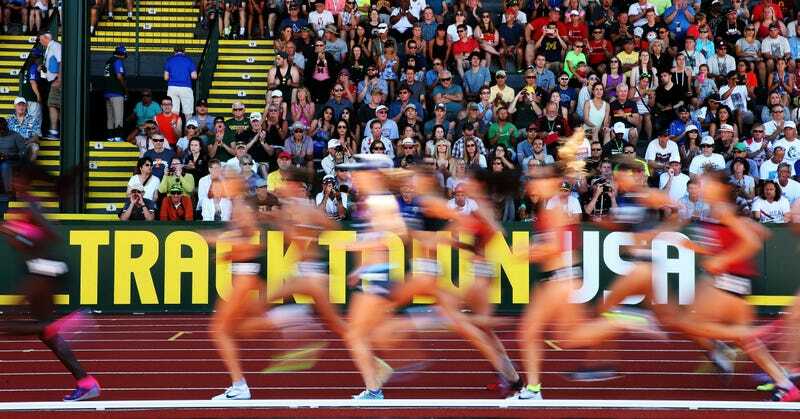 By any standard, it was warm in Eugene, Oregon on July 2, game-changingly so for the 24 women who shook their legs and jumped at the start of the Olympic Track Trials 10,000 meters. In a selection race like this—top three make the Olympic team—time is less relevant, place is everything. Place and grit. A championship 10,000 meters favors the relentless grinder who accepts the inescapable heat and the inexorable depletion of reserves, like a kettle boiled dry, who can hold off despair at seeing the pack slowly pull away, and not give up. Because anything can happen. Rochelle Kanuho, a slight figure and the only one in the field wearing a full singlet, shorts, and black crew socks, quietly worked away at the back of the main pack, 78 seconds per lap at 10 laps, at 16 laps, at 20. Some of the familiar faces and early leaders—Jordan Hasay, Kim Conley, Aliphine Tuliamuk—had fallen back, but surprisingly, Kanuho, impassive, was still there. Surprisingly because Kanuho came into the race as the 18 seed, a relative unknown. As Molly Huddle—the overwhelming favorite out front—ratcheted up the pace (73 seconds per lap, 72 seconds per lap), the pack dwindled to five women with long and impressive resumes, strung out in single file, and Kanuho at the end of that line. Six-hundred meters to go, the pace was furious, arms clawed, faces grimaced. Except for #12, Kanuho. Scraping bottom and wringing it out, Kanuho closed in 70 seconds—the third fastest last lap of any competitor—for seventh place. She’d moved up 11 places from her seed position, and finished within 24 seconds of her personal best in conditions that left even seasoned pros staggering off the track. Who is this Rochelle Kanuho? Born and raised in the Flagstaff, Arizona area, she never lived with her seven half brothers and sisters, and didn’t meet her dad until she was 16. She’s of Native American and Mexican descent, with the last name of a stepfather who was out of the picture by the time she was five. Her introduction to sports came in the form of gifts from her dad—soccer balls or lacrosse equipment—and sporadic involvement in community sports. But there was never enough money, or they moved out of the area. Not yet topping 65 pounds in fifth grade, Kanuho struggled with the burden of responsibility, alternately justifying and resentful of her only parent’s inability to parent. Remembering her brief success in running, Kanuho was looking forward to running cross country at Coconino High School, but she missed most of the freshman cross country season because her mom wouldn’t schedule the physical she needed to participate in sports. Once she started cross country she was almost immediately the top runner, but was ineligible for the state meet because she’d missed the bus to regionals. Kanuho went to state in cross country her sophomore, junior, and senior years, and the two-mile in track all four years, but it wasn’t her times or her running ability that impressed Diane Sorden—it was her grit. Sorden and Coconino’s cross country coach, Tsosie Taylor, saw something special in this tiny, quietly determined girl, and were the first adults in her life to fan the spark. Come senior year, Kanuho hadn’t even considered college as an option—no one in her family had attended, they barely had money for food, her grades were good but not exceptional, and her cross country and track performances did not inspire recruiting calls. “Also, we didn’t have a phone,” she added. “I wouldn’t not let her apply,” Sorden said. Sorden gathered all the paperwork, and though she couldn’t get needed information from Kanuho’s mom and dad to properly fill out a FAFSA, they sent off one application to Northern Arizona University. Kanuho received some scholarship but also had to take out student loans because she wasn’t officially homeless. Yet. “My mom left,” were the only words Kanuho would spend on that event, instead focusing on how kind and helpful Sorden was in the life-changing transition to higher education. She lived with Sorden the summer before moving into the dorms at NAU. Finding a spot on the cross country team was another story. Sorden brought Kanuho over to meet the D1 Lumberjacks’ head coach, Eric Heins, multiple times but, according to Kanuho, her times weren’t even good enough to walk on. Kanuho finished out her last three years (including a fifth redshirt year) on full scholarship, the top distance runner on the team. Her resume included a degree in parks and rec management, a 16:12 5,000 meter best, 34:20 10,000, and a 46th place finish at the Cross Country National Championship. Again, decent for NAU, but hardly the makings of a pro career. The only post-collegiate training group that showed interest was headed by coach Scott Simmons, in Colorado Springs. He engineered gear and travel money through Boulder Running Company/Adidas, but the clincher was that Simmons invited Kanuho to live with his family rent-free. She thrived in the supportive atmosphere, physically and emotionally, fitting a 70 mile per week regimen around various jobs. And her running reflected that—within a year, she brought her 5000 meter time down from 16:12 to 15:25. At 24, she’d found a family of coaches—Sorden, Taylor, Heins, Simmons. She moved back to Flagstaff, a training mecca for distance runners because of its altitude and miles of soft trails, in January 2015, with Simmons’s blessing and promise to continue coaching from afar. After three months of solo speed workouts, deciding whether to adjust the workout on a bad day or plow through, Kanuho found that working out alone was not working out. In March 2015 she joined Northern Arizona Elite, a training group coached by Ben Rosario. NAZ Elite is sponsored by shoe maker Hoka One One, so Kanuho gets gear, travel funds, and enough of a stipend to train full-time, no side job required. While some would call running, eating, and sharing an apartment with two roommates austere, Kanuho is living the dream.